Jaguar Cars Ltd, usually called just Jaguar comes from very humble beginnings. The Swallow Sidecar Company made the first Jaguar in 1935. Until then Swallow only made motorcycles. The first series of Jaguars were known as the SS Jaguar. Following the end of the War World II the company changed its named Jaguar to put distance between itself and the unfavorable memories the initials SS might invoke in the British population. In 1968, Jaguar merged with the British Motor Corporation. Later bought by Leyland. Leyland then became nationalized as British Leyland. In 1989 It was bought by Ford Motors and sold to its present owners, Tata motors of India. The company located in Coventry, England continues to make great luxury automobiles in the UK. Our shop’s experience covers the various owners and technologies. 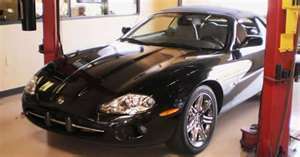 We offer top notch Everett Jaguar Service and Repair. We are just as comfortable work on Jaguar XKE of the 1960s as providing dealer level service to a brand new 2012 Jaguar XF. While Jaguars are famous for their beauty and their luxury, many model years also enjoy some infamy for their mechanical idiosyncrasies. No matter what year your Jag was made, our ASE certified technicians have the training and skill to keep your running as it did when it left the showroom floor. Knowing the details of each manufacturer’s technique and factory experience requires a commitment from the auto technicians who work on your Jaguar. Our techs are not just experts they love Jaguar cars. Whether your car needs routine service a major or minor repair or a complete engine restoration, we can do the job right, and on time. Sometimes, extensive work on older models may be delayed due to original parts search, but with our experience, we know where to source hard to find parts and get them as fast as possible. While we are experts when we work on Jaguars, our prices are usually less expensive that a dealership and our work equals or exceeds that of a dealership. Next time your Jaguar needs service or repair, bring it to Conaway Motors. You will love our high quality work and affordable prices!